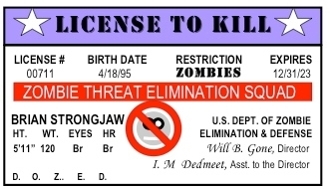 Zombie Hunter "License To Kill"
Laminated, wallet-size license to hunt zombies personalized with your name and stats. Fill in the application on our blog www.Dozed.org. Pay your fee here. Shipping included. Copyright © 2012-2019 D.O.Z.E.D. G E A R. All rights reserved.